More Ghiradelli came in. Awesome. Chris, I think you’re dead-on about the beard. I wish I could show up to job interviews with 5 o’clock shadow. I’ve always felt like the points I lose appearance-wise would be made up for with the additional self-confidence. It’s the kind of things that would benefit from experimenting, but I’ve never had the will to do it. I just finished Yann Martel’s “Life of Pi” for the second time. I love that book so much. It’s brilliant. It’s my favorite book. Our team ran the last ~100 metres of the relay race together (though Jim was technically the anchor), thus most of us had changed into flip-flops since we’d finished our real runs. Trent also decided to wear an ’ie with the name of his village for the final 100 metres. Thus the picture at the top of Saturday’s post. Trent had actually planned to wear the ’ie for his legs, but ended up stowing it away in the van. I also planned to tell my team that I’d taken a wrong turn on my third leg and run pretty far out of the way before turning around and finding the course again. Though we spent much of Saturday goofing off, no one seemed willing to make light of the running. So Trent and I made our jokes privately. Jim, Trent, Koa, and I went to check out the RSA on Saturday night. RSA (I forget what this stands for, but I think it’s something equivalent to VFW in the United States) is a nightclub in town. We were a bit weary of the $5 cover, but it ended up being totally worth it. Luisa texted me today, “Did I tell you they’re implementing new MLB helmets? 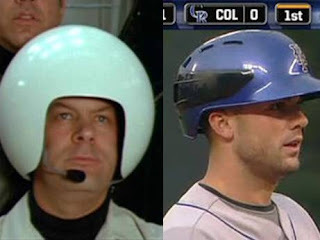 The new ones are supposedly safer, but it just looks like Spaceballs.” To which I responded, “So now Dodger fans will be sitting at a game realizing they’re surrounded by Assholes?” Zing! At the beach fales last night, we were talking to the other guests staying there, and it turned out one couple was from San Leandro. Small world, right? When she found out Amanda and I went to Logan, she said, “I know 2 people from Logan. Let’s play this game.” It turns out she knew Tommy’s brother, J.T., and Kelson, who sat behind me in calculus. Small world, right? Amanda pointed out that we’ve heard some Akon-ish song with the lyric “Feel my heart beat” at least twice on the bus today, a couple times on the bus yesterday, and once in the taxi on the way in from the airport. 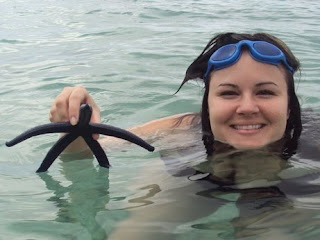 Welcome to Samoa, Amanda. 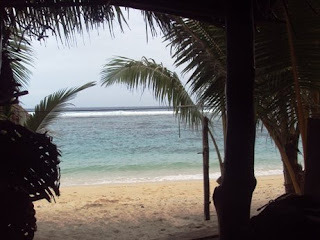 Welcome to Samoa. Amanda brought a 2009 USC Football poster that her friend Joanna’s brother was able to snag. Excellent work. Much thanks to all involved. On the way to the airport yesterday morning, we were flying through the darkness though the taxi driver wasn’t familiar with all the new speed bumps yet. We flew over an unmarked one. He and I both spotted it and the same moment. He slammed on the brake and I assumed crash position. I may have overreacted. We ended up taking the rest of the drive at around 20 mph. 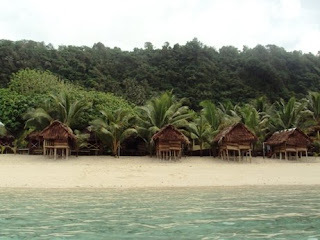 Faofao Beach Fales at Saleapaga. 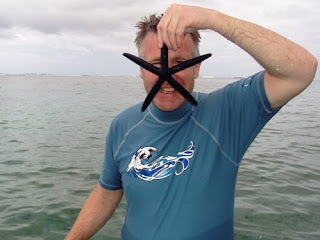 Other guest Patrick with starfish. you and Amanda are darling! i'm doing well catching up on your blog, eh?? although, sometimes i get distracted with your recent posts. lol!